In recent years, many companies have concentrated on the implementation of integrated IT solutions in business areas and order processing. However, the integration of processes and data of product development has often been ignored. The consequence: A large amount of information is still conveyed on paper in the age of e-business. CoRoS Consulting supports you with innovative consulting competencies during the implementation of efficient Product Lifecycle Management. Together with you we develop solutions for the management of your product data. From the concept to technological implementation, the methodical view of your processes is always in the foreground. Optimised processes set free capacities in engineering; you can concentrate on the development of innovative, profitable products. Integrated Product Lifecycle Management is the cornerstone for a successful entry into e-business. CoRoS Consulting delivers global business solutions that improve process efficiencies through knowledge sharing and collaboration between employees, customers and business partners, using best-of-breed technology and applications in the market. CoRoS Consulting has built upon its position as the leading Project Systems (PS) specialists for the SAP market by expanding into the Product Lifecycle Management (PLM) services market for SAP. This natural extension serves has a starting point for our collaborative commerce solutions, and paves the way for future growth and opportunity of our firm. Product Lifecycle Management (PLM) is an industry term used to describe the business solutions that allow a company to manage product related information and processes throughout the lifecycle of a product from concept and definition to production, service, and retirement and throughout the extended enterprise that creates and uses the product information. By closely linking a company's engineering, production and maintenance operations, PLM enables accurate communication of product and asset information throughout the extended supply chain. It enables design engineers, quality managers, business partners and manufacturing staff to work together in a collaborative environment for product development. For plant operators and maintenance managers, PLM provides a complete and integrated solution to manage their assets from the investment decision onwards through maintenance management and replacement. The solution also incorporates business partners' knowledge into the design, management and maintenance processes, resulting in higher product quality and greater flexibility to meet customer needs. The pressure in your markets to be innovative, enhance quality and cut costs is continuing to rise. You therefore need to accelerate your development processes while, at the same time, improving product quality and the use of resources - through Product Lifecycle Management (PLM). Rather than working with heterogeneous systems and data, your employees will access a consistent, up-to-the-minute data pool. As a result you can enjoy the competitive advantages of increased process efficiency and transparency, more productive employees and lower costs. Numerous analyses show that PLM, combined with standardised development methods, can shorten the development cycles for new products by up to 60 per cent - regardless of their complexity and therefore regardless of the industry. Up to now, PLM has been most prevalent in the automotive and high-tech industries, as well as in mechanical and plant engineering. However, it is also becoming increasingly important in other industries, for instance in the consumer goods, chemicals, and pharmaceutical industries. 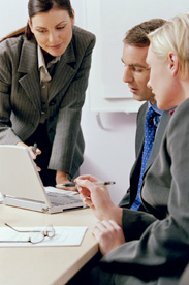 Whether you combine it with customer relationship management, supply chain management, enterprise resource planning, computer aided design or supplier relationship management, you can rest assured that implementing PLM will bring you crucial advantages in areas such as the ability to deliver, methods of addressing customers and service. PLM supports all phases in the life cycle of a product - from development and production to technical asset management. Our consultants know the development, production and service processes in all sorts of sectors, and also have the technical system expertise needed for integration. CoRoS Consulting has the expertise to design and implement your PLM solution. We are your ideal partner; from initial considerations through to operation. Together with you, our specialists will design and implement an individual PLM solution based on mySAP Product Lifecycle Management. If needed, we can expand the PLM functions to meet your customer-specific requirements, integrate other SAP and non-SAP applications and operate the systems for you in the context of outsourcing. Let CoRoS Consulting help you make the most of the advantages of PLM! We have the necessary business expertise and we are familiar with your industry. With our help you can transform PLM potential into a competitive edge. SAP defines mySAP Product Lifecycle Management (mySAP PLM) as "an integrated environment that ensures all people involved in product development, manufacturing, and service have quick and secure access to current information." It claims that "mySAP PLM" is the only e-business solution available today that enables collaborative engineering, custom product development, and project, asset, and quality management among multiple business partners."